On this France riding holiday, explore the Loire Valley and its chateaux, which have inspired visitors for centuries. Enjoy ornate architecture around the most famous French castles of the Loire Valley, elaborate decoration and lavishly planted gardens-- the playgrounds of the French nobility. Riding from chateau to chateau takes you back to the 16th century when the surrounding land was reserved as royal hunting grounds. Highlights include the Grand Chateau de Chambord constructed like many others in the distinct French Renaissance style that blended traditional medieval and classical Italian forms. Your guide, Anne-France, brings history to life with stories of the political and royal intrigues that have been linked with these magnificent estates from the time of Richard the Lionhart and the Knights Templar, through to Joan of Arc and the Valois and Bourbon Kings. Spend nights in elegant small family run hotels converted from chateaux and ancestral homes. Enjoy gourmet picnics out on the trails with local French food and elegant candle-lit dinners with fine cuisine. You should be a confident, intermediate to advanced rider. This means you need to be in control of a horse at walk, trot and canter in the open. Some of the trails involve long canters and require a good degree of fitness; on others the pace is more gentle with only occasional canters. Before you leave. If possible, prior to your trip, try to ride a horse 3 or 4 times to train your muscles for a a few hours in the saddle each day. Review things like, tying knots, grooming, adjusting your saddle and bridling a horse. Someone will be there to help you, but these skills are always helpful! The mild climate was one of the reasons so many château were built here. Spring and autumn are mild and summers pleasantly hot. Rainfall is generally low but showers can occur at any time of year. Pack your riding clothes, including comfortable trousers, riding boots, a waterproof jacket, riding helmet, gloves, sunglasses and sunscreen. For the evenings, wear clothing in which you feel comfortable, but would be suitable to have dinner at a gourmet table. Ask us for more packing recommendations! The horses for this France riding holiday are mixed breeds trained for trail riding. Your riding vacation companion is choosen for you according your level, height and weight. Excursions are coached by a state certified staff. English saddles. During these French riding holidays, enjoy castles, food, wine tastings, and the beauty of the Loire Valley. Each day has something new to discover! Check out the itineraries tab for more details. Each night you overnight in elegant small family run hotels converted from chateaux and ancestral homes, located close to the castles that you will visit. Enjoy gourmet picnics of local delicacies and elegant candle-lit dinners with fine cuisine. Stay amid the magic of old-stone walls, hundreds of year-old trees, and comfortable and refined twin rooms with private bathrooms. A heated swimming pool often offers relaxation after the ride. We offer you a taste of genuine gastronomy from Heart of France, including picnics with foie gras, traditional food of the region, gourmet dinners in private chateaux and more to fully taste and experience the French way of life! Intermediate to advanced horseback riders who want to experience the beauty of France from on horseback and are seeking an inn to inn type riding vacation. This vacation takes you to stunning chateaux and has nights in one of a kind family fun hotels with lots of great history. Itinerary 3 Set arrival and departures. Private groups by arrangement. This trip is for Intermediate, Strong Intermediate or Experienced Riders. professional guiding by certificated staff, visits and shows. transportation during the riding vacation. extras such as phone calls, drinks, etc. transfers from and to stations or airports. In the morning, spend about 2 hour on horseback. Ride to Chateau de Beauregard through the countryside and vinyards. We have the privilege to enter the front path of the Chateau–– an unforgetable experience! During our visit to Chateau de Beauregard, discover his famous "gallerie des illustres", intact since XVII century. Picnic with Foie Gras in Chateau de Beauregard. In the afternoon, you'll spend about 2 hours on horseback. We leave to ride to Chateau of Cheverny, once again through the beautiful countryside and Cheverny vinyards. Visit of Château de Cheverny, a stately estate and has been in the same family for more than six centuries. Gourmet dinner and night at Chateau du Breuil, a charming luxury castle hotel located in Cheverny, at the very heart of the Loire Valley. In the morning, ride about 3 hours and 30 minutes on horseback. On the way to Chambord, we'll traverse the countryside and the Boulogne Forest, a remnant of the ancient oak forest of Rouvray. 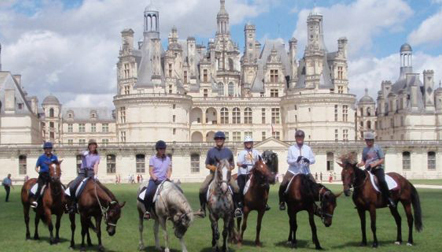 We arrive to Château de Chambord on horseback and enjoy a royal lunch in Chambord. Visit Chateau de Chambord, one of the most recognizable châteaux in the world because of its very distinctive French silhouette. Transfer to a charming guest housse Coté Loire, nestled back from the road that follows the bank of the Loire River, in Blois. Enjoy a gourmet dinner in a restaurant in Blois. Night show Chateau de Blois. Night at Coté Loire in Blois. Day 4 : Free day in Blois. Transfer to charming Chateau de l'isle near Chenonceau for 3 nights. Dinner, briefing and night in Chateau de l'isle, a XVIIIth century mansion that charm you with its unique architecture and green surroundings. In the morning, spend about 1 hour on horseback. Ride to Chenonceau from Chateau de l'isle by the banks of the beautifull Cher River. Visit of Chateau de Chenonceau, a French château spanning the River Cher, near the small village of Chenonceaux, and gardens of Catherine de Medicis and Diane de Poitiers. Lunch in Chateau of Chenonceau, one of the most well-known châteaux of the Loire valley. In the afternoon, spend about 3 hours on horseback. Enjoy a wonderfull ride along the Cher river to Chateau de Nitray. We discover Chateau de Nitray from on horseback, and then learn about the chateau, caves and have a wine testing. Gourmet dinner at the Chateau de l'isle. In the morning on this day of your France riding holiday, you'll spend about 2 hours and 30 minutes on horseback. Ride from Chateau de l'isle to Pagode de Chanteloup through the countryside, vineyards and the Amboise Forest. We discover Pagode de Chanteloup on horseback and have our picnic with foie gras in front of the Pagode. Visit Pagode de Chanteloup, a 140-foot, seven-story Chinese-style lakeside pagoda built for the Duke of Choiseul in 1775, and a small museum. In the afternoon, spend about 1 hour on horseback. Ride to Chateau d'Amboise by the old town of Amboise. We'll have a special arrival to Chateau d'Amboise on horseback by "la porte des Lions", the mediaval king's door! We then enjoy a private guided visit of the very historical Château d'Amboise where Leonardo da Vinci is buried. It's been recognised as a monument historique by the French Ministry of Culture since 1840. Transfer to Château de Pray in Amboise. Enjoy dinner and a night at Château de Pray, which dates back to 1224 and resembles a tower-flanked castle on the Rhine. Breakfast at the chateau and then departure. ** Itinerary subject to changes based on the weather and trip guide's discretion. Itinerary 6 Set arrival and departures. Private groups by arrangement. This trip is for Strong Intermediate or Experienced Riders. Day 1 Arrival from train station of Saumur to Château de Beaulieu at Saumur. In the morning, spend about 2 hours on horseback. Ride to the Champigny troglodyte cellar from Chateau de Beaulieu through the vinyards, with a magnificient view on Chateau of Saumur. Arrive on horseback to the cellar–– an unforgetable experience! Enjoy a Champaigne wine testing in the cellar and a gourmet lunch in a local restaurant. In the afternoon, ride for about 2 hours in the Champigny vineyards, and along Loire River to Chateau de Montsoreau, a castle fortress in the market town of Montsoreau. The Chateau inspired Alexandre Dumas's novel La Dame de Monsoreau, based upon the amorous escapades of two ladies who occupied the castle during the reign of King Henri III. Dinner and night in Chateau de Beaulieu, which was built in the 18th century and is recognized for the beauty and charm of its architecture. On this day of your French riding holiday, spend about 2 hours on horseback in the morning riding through vineyards and countryside to Chateau de Brézé. Enjoy lunch in the old stables of Château de Brézé. Visit Château de Brézé. You'll horseback ride for about 2 hours in the afternoon through vineyards, countryside and woods to Abbaye de Fontevraud or Fontevraud Abbey, an UNESCO World Heritage Site between Chalonnes-sur-Loire and Sully-sur-Loire. The arrival inside the Abbey is magical, as you ride in on your horse! Dinner and night at Domaine de Mestré, which is the old farm of Fontevraud Abbey. It has a French country home atmosphere. In the morning, ride for about about 2 hours through the traditional French countryside to Chateau de la Roche Martel, a private and historical chateau where you are welcomed by the owners for a picnic and a visit. In the afternoon, horseback ride for about 2 hours in the countryside and woods to private Chateau de Ternay and enjoy a cordial welcome by count and countess of Ternay. Dinner and night in Chateau de Ternay, a Monument Historique on twelfth-century foundations, the present château is the result of building campaigns from the fifteenth to the seventeenth centuries. On this day of your France riding vacation, you'll spend about 2 hours on horseback, riding to Chateau d'Ussé from Chinon Forest. You arrive to Chateau d'Ussé, a stronghold at the edge of the Chinon forest, and enjoy lunch in Ussé. Horseback ride for about two hours in the afternoon to Chateau de la Chatonnière at Azay le Rideau enjoying unforgettable long canters along Indre River, woods and orchards. Visit the gardens of Chateau de la Chatonnière and spend the night in the mediaval hotel Gargantua of Chinon. Ride for about 2 hours and 30 mintues in the morning through countryside, vinyards, and woods to Chateau de Villandry and its famous gardens. Lunch in Chateau de Villandry, a castle-palace located in Villandry. In the afternoon, visit the wonderfull gardens and Chateau de Villandry. Next, transfer to imposing and private Chateau de Gizeux, which dates from the Middle Ages and is the longest château in Touraine angevine. Enjoy a welcome and visit Chateau de Gizeux with the owners. Dinner and night at Chateau de Gizeux. Day 7 Breakfast and departure. Transfer (not included) to TGV Tours Saint Pierre des Corps station. (you will need a reservation). ** This itinerary is flexible. Changes may occur due to weather and other unforeseen circumstances. A truly special and new riding vacation, the Cadre Noir Riding Vacation takes you insdie famous chateaus, through a once in a lifetime tour of the French National Riding School and Cadre Noir of Saumur-- all the while horse riding through the countryside and vineyards and staying in historic and traditional French accommodations with the best local food and wine. The Cadre Noir is the corps of Ecuyers, or instructors, at the École Nationale d'Équitation, the French military riding academy at Saumur in western France. It also performs as an equestrian team. This military troop was founded in 1828 and is one of the most prestigious horsemanship schools in the world. Arrival at Relay of station of the XVIIIth century Le Patio in Saumur. It's possible to visit the Chateau of Saumur, originally built as a castle and later developed as a château (included). Briefing, dinner and night at Le Patio. In the morning, ride for about 1 hour and 30 minutes on horseback. You'll begin the ride in front of the Château of Saumur and ride to the the heights of Saint Hilaire Saint Florent where the prestigious Cadre Noir and sumptuous installations of Ecole Nationale d'Equitation (French National Riding School) is located. Lunch in Ecole Nationale d'Equitation (ENE). Spend about 2.5 hours on horseback in the afternoon. Enjoy a private ride inside ENE and special access to discover on horseback the eventing fences of Hippodrome de Verrie where International 3 days Events are organized. Enjoy a private guided visit to the stables of Cadre Noir and Ecole Nationale d'Equitation. Enjoy an apéritif in Bar le Canter, a place of where riders and champions get together. Diner at Saumur, night at Relay of station Le Patio in Saumur. The bedrooms, comfortable, roomy and quiet, were restored with respect for the original building and with concern for your well being. You will be allured by their charm and authenticity. In the morning, participate in a private clinic with an ecuyer or instructor of Cadre Noir de Saumur who will explain the Traditional French Equestrian methodology, and its application on the preparation and the progression of a dressage horse. Lunch in Ecole Nationale d'Equitation. Spend about 3 hours on horseback in the afternoon, riding through the countryside with spectacular views on the Loire. Visit of Romanesque churches of Chenehutte and Trèves. Night at Manor de Beauregard in Trèves, a a real treasure. Dinner at les Rosiers sur Loire. Ride for about 2.5 hours in the morning. Start the ride to Prieuriale of Notre Dame de Cunault, a masterpiece of Romanesque art. Visit of Prieuriale of Notre Dame de Cunault. Lunch at restaurant l'Aubergade in Gennes, a favorite in the area. In the afternoon, spend about 2 hours on horseback. Ride along several megaliths, traces of the settlement to the Neolithic era. Enjoy an aperitif and dinner on a traditional boat of the Loire from Chenehutte to Saint Hilaire Saint Florent. Night at Chateau Bouvet Ladubay, in the heart of Saumur Wine Region, in Saint Hilaire Saint Florent. Spend about 2 hours on horseback this morning. Start the ride from Ecole Nationale d'Equitation past the underground sculptures of Pierre et Lumière. Visit of underground sculptures Pierre et Lumière, where many of the most well-known sites of the Loire valley have been carved out of tuffa stone by a Breton sculpturist. Castles, towns, villages and churches have been sculpted in the finest detail, with the most dramatic being a bas-relief of the nearby town of Saumur. Also visit the museum of mushrooms, a museum devoted to all things related to the humble mushroom. Lunch at Ecole Nationale d'Equitation. In the afternoon, spend about 2 hours on horseback riding inside the wonderfull sandy alleys of Ecole Nationale d'Equitation. Dinner at Bar Le Canter. Evening gala of the famous Cadre Noir de Saumur. Night at chateau Bouvet Ladubay in Saint Hilaire Saint Florent. This once in a lifetime riding vacation includes riding in the Bay of Mont-Saint-Michel, exploring the Normandy countryside, beaches and D-Day history, medieval villages and fabulous châteaux. Arrival at beautiful Chateau de Bellefontaine, close to the historic centre of the medieval town of Bayeux. This 18th century chateau features a moat and a water feature visited by swans and ducks with reflections of the bicentennial trees on its banks. Briefing, dinner and night at Chateau de Bellefontaine. In the morning, ride for about 2 hours in the hilly landscapes of Normandy. Arrive on your horse in the old city of Creully to visit médieval Chateau de Creully, an 11th- and 12th-century castle. From June 7, 1944, the day after D-Day, until July 21st, its square tower housed BBC war correspondents and their radio studio The first news of the Battle of Normandy was transmitted from here. Visit the XIII century church of St Martin and have lunch in Creully. In the afternoon, ride for about 2 hours in the Normandy countryside and arrive on horseback to medieval and XVIII th century city of Bayeux. Dinner and night at Chateau de Bellefontaine in Bayeux. In the morning, visit Bayeux cathedral, a Norman- Romanesque cathedral, located in the town of Bayeux. See the famous Bayeux Tapestry dating from the 11th century, and listed as a “Memory of the World” by UNESCO. Horseback ride for around 2 hours in the afternoon. Explore the countryside with a spectacular arrival and panoramic view of the Arromanches sea resort and its famous Mulberry port. Canter on the beach, if possible. In the very heart of the D-Day beaches, Arromanches is renowned for its "Mulberry" harbour, known as "Port Winston", whose remains remind visitors of the remarkable technical feat of taking 600,000 tons of concrete and equipment across the Channel in wartime to serve as a base for Allied troops. Ride for 2.5 hours this morning along the cliffs and through the countryside. View the famous battery of second world war. Lunch in Port en Bessin in the Basse-Normandie region in northwestern France. Horseback ride in the afternoon for about 2 hours on horseback. Ride along cliffs and on the boulversante range of Omaha. Visit of the American Military Cemetary or Overlord Museum. Transfer by car to Chateau d'Agneaux, which offers individually decorated rooms equipped with period furniture. On this morning of your Normandy riding vacation, spend about one hour on horseback. Ride along the River La Vire to Haras de Saint Lo, the heart of famous Selle Français breed. Visit the stables of a French show jumper, if possible. Ride for around two hours in the afternoon along the river and in the countryside to Agneaux. Transfer by car to Manoir du Brion, also known as the Château de Brion, a former Benedictine priory of the abbey of Mont Saint-Michel in Mont Saint Michel Bay. Night in Manoir de Brion. 5 hours on horseback in the fabulous Mont Saint Michel Bay. Lunch in a local and typical creperie. Night in Manoir de Brion. Depart or stay to visit more of Mont Saint Michel on your own. Transfer (not included) to TGV Rennes station. In the morning, spend a little over 2 hours on horseback. Ride to Chateau de Beauregard through the countryside and vinyards. We have the privilege to enter the front path of the Chateau–– an unforgetable experience! In the afternoon, you'll spend about one hour and 30 minutes on horseback. We leave to ride to Chateau of Cheverny, once again through the beautiful countryside and Cheverny vinyards. Visit of Château de Cheverny, a stately estate and has been in the same family for more than six centuries. In the morning, ride about 3 hours on horseback. Transfer to a charming guest housse Coté Loire, nestled back from the road that follows the bank of the Loire River, in Blois. Enjoy dinner at Cote Loire. This is a spectacular ride with an experienced and knowledgeable guide, faultless organisation, amazing chateaux and charming hosts. Lise and I enjoyed very much our horses and the whole trip – so thank you for that as well. Lise and I might go to France next year for an elongated weekend ride at Cheval-de-Loire in order to ride “our” two wonderful horses. We never got the names right of the horses, so can you please e-mail us the names of the little darlings.The Saumur ride seems tempting, so you might see us there at some point in the future. We want to thank you for a great summer expierience. You had arranged a fantastic trip. We lived well, lovely food and wine and the horses was wonderful. Moreover, it was a very nice group to ride with, this was fun. We would recommend the trip to others, and do not rule out that we will be back. I have travelled extensively and I have to say that I was blown away by some of the places we stayed. The personal welcome by the hosts, the tours of their homes, the jaw-dropping beauty of the rooms were outstanding. I love history, so was enthralled to hear about historical events which took place there. It was as if the French Revolution was a few years ago. I appreciated very much the care and attention that Anne-France took to provide us with lodging that had character. The riding was very interesting as we passed through many different types of countryside, and a highlight was the wine tasting in a troglodyte cave. Another: cantering beside the river. 3 - 5 hours riding per day. The Loire Valley is a couple of hours south of Paris by car or train. There are good high speed rail links via Paris alternatively take the ferry to one of the southern channel ports (Caen, Le Havre) and it's about three hours drive from there.